professional chef could imagine. That really sounds like I'm boasting, I know, but the truth is that I've come to my position with humble steps, often hand held by supportive people around me. Jeff Nathan's Family Suppers. My work was featured in a photo spread in Art Culinaire, a celebrated trade magazine. 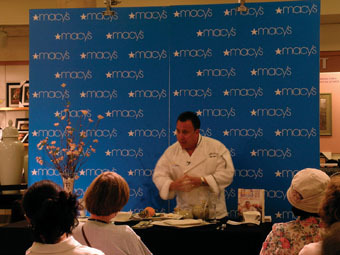 I've cooked and won awards at the esteemed James Beard House and taught classes at De Gustibus at Macy's. If I were reading this about someone else, I'd be impressed, but it's about me and I'm amazed! That's who I am right now. How I came to the position I'm in now is really a journey of my rites of passage, motherly support and pure chutzpah…. Early on I knew that a traditional school setting wasn't for me. As soon as I could, and with my parents' permission, I quit school and joined the Navy. Boot Camp was nine weeks of a grueling, man-making, experience. After Gunner's Mate schooling in Chicago, I received my first commission in the Navy. I was 18 years old and stationed in Norfolk, Virginia as a missile technician on board the USS John King, a naval destroyer. My duties there didn't make me happy. Unfortunately, I knew it would be difficult to change my rating after so much time was invested in my education in that area. Even at that early stage in my life, I was bold enough to seek out what I wanted. There were 400 people on board the ship and they had to eat, so I found my way into the kitchen, befriended the cooks, and was invited in to help out. I continued with my duties as a missile technician, but raced toward the kitchen when those responsibilities were done. baking cookies and breads for them. Our ship was traveling throughout the Mediterranean and when we docked, I raced through the cities purchasing ingredients unique to those ports. The introduction of these fresh foods from foreign lands was mind boggling. I was amazed at the magnificence in flavor just because of the fresh ingredients. To this day, one of my cooking philosophies is, the fresher, the better. I finished my four years in the Navy and still looked to be part of the world of cooking. The GI Bill enabled me to enter college on Uncle Sam's dollar. The school I wanted to go to was the Culinary Institute of America (CIA) in Hyde Park, New York. To be accepted into this prestigious school, an applicant needed to hand over numerous references in order to be considered. My references from cookie filled Officers and the Captain on board the USS John King, and the chefs at the neighborhood restaurant where I began my forays into the kitchen, were impressive enough to add me to the CIA's graduating class of 1980. I worked harder than I ever had before and was driven by the pure incentive of loving it! After graduation and working for free in several top New York City restaurants, I answered an ad in the New York Times for a position as a chef in a new restaurant in SoHo, an artsy, cool area in New York City. I started working at The New Deal in March 1982; made myself known for the Wild Game Menu we offered and began an unmatched professional and personal relationship with Harvey Riezenman, the owner of New Deal. As partners, Harvey and I embarked upon other culinary ventures including an Italian restaurant, La Pentola Pazza; and a gourmet deli, Alison's Gourmet, named for my wife. was for sale. It was a kosher restaurant that needed a boost. For a non-kosher chef and non religious Jew, those two words, kosher restaurant, were taboo. project; so I began to investigate and inquire. I was still disturbed by the limitations of the kosher ingredients, but I knew there had to be something more. My obsessive personality drove me to study whatever I could. I wanted to keep Abigael's a fleishig (meat) restaurant, so I researched Asian, Indian, Moroccan and other North African cuisines, since these are cultures that don't use much dairy. Shell fish and other creatures of the sea are, of course not allowed. I found solace in the fact that there were many other fish to fry… or bake, broil and grill. The cuts of beef that were allowed were limited, but not nil; I visited a kosher meat plant and familiarized myself with the parts of the cow that I would be able to use and got a refresher course on the regulations and timing of the salting and soaking of meats. The regulations of the USDA are as involved here, as are the laws of kashrus. I studied, investigated, researched and asked questions until my tutors were worn out. We entered into a partnership with Bob Ross, the broker, and bought the restaurant. I couldn't keep the restaurant in its current state, so I decided to promote Abigael's as an upscale dining experience specializing in American food with global influences. I wasn't claiming to cook in the traditional Jewish style. Instead, I was offering great food which just happens to be kosher. We weren't limiting our marketing of the restaurant as solely kosher either. My foods would be inviting to all. A snapshot photo taken at any time would show a diverse crowd of people; Jews and gentiles, orthodox, observant, kosher, non-kosher. The customers would come for great tasting food. They would leave amazed that it was kosher. It offered tastes that until recently could only be non-kosher. integral items in our heritage, but as a manipulator of ingredients and a creator of cuisine, I am here to tell you that there is definitely more! in a kosher restaurant, I was no longer able to buy from the purveyors I had in the past at my other restaurants. Each purveyor had to be under kosher supervision in order for me to be able to buy from them and most were not. For a while I was left with minimal ingredients to inspire me, but I could not allow the lack of available ingredients to forever restrict my menu. consumers would be beneficial for all involved. It was big news when Nabisco changed things around and produced their Oreo cookies under kosher supervision and approval. in these markets, and so established companies didn't have to make a great product. Now that kosher foods are facing others in the market, their products are improving. The variety of what they offer has multiplied. Kosherfest, the annual showcase of kosher foods has increased their offerings year after year. It's exciting to see the changes that have occurred. cooking. Perhaps that sense of being on the verge of something big was this… not to speak on the beauty of our faith ~ leave that to the Rabbis, but to speak on the delights of our culinary heritage; the traditional dishes and the new classics. Nothing stood in my way of saying yes to this great offer. I had been a spotlighted chef on many daily talk shows, including Live with Regis and Kathy Lee, the Conan O'Brien Show and Roseanne and I fully expected the workload to be similar. Error in my judgment there! I am still amazed at the months of planning for each television season. Figuring out the intricacies of cooking the showcased recipes that would actually take hours in real life and doing it all in a half hour show was mind boggling! Working with those two is always an extraordinary experience. It is with tremendous gratitude and great pride that I'm able to offer my knowledge and talents as a chef. Anyone can make a nice mealtime offering with the proper ingredients on hand. But what's the most important ingredient to any dish? Add passion to your list of ingredients and your meals will sparkle. Restaurant Gourmet at Home? Yes, You Can! By: Menachem Lubinsky, President & CEO of LUBICOM Marketing Consulting and is the founder and co-producer of Kosherfest.